The Argentine Revival influenced many Vancouverites during the last couple of decades of the 20th century. 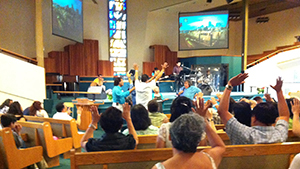 Many visited and even more attended local events featuring their evangelists. Among the leading figures was Hector Gimenez, pastor at that time of one of the largest churches in the world. So he was a familiar figure to many of the people who went to his healing rallies at Harvest City Church in Vancouver (June 30) and other local churches. He was accompanied by pastor Rauna May, who is serving at Surrey Vineyard after eight years with New Hope Christian Fellowship in Honolulu, Hawaii. Now pastor of Cumbre Mundial de los Milagros in Buenos Aires, Gimenez is expected to be back in the Vancouver area in a couple of months. He was also at Oslo Christian Center in 1994 when I went to Bible school there. We experienced a move of God through his services.